Need more information about booking Home 143575 ? This property has been appointed to a very high standard. It has solid marble floors on the ground floor and lower level with a hardwood stairscase to the first floor where the bedrooms all have solid wood floors. The property is on 3 floors taking advantage of its position on the hillside having fantastic views from all levels. The ground floor has a large open plan living room with dining kitchen, the living room having a spectacular floor to ceiling window giving fantastic unimpeded views towards the sea. The kitchen is fully equipped with dishwasher, washing machine, fridge-freezer, hob and oven, all surrounded by a solid granite worktop, with additional microwave and toaster. There is also a double bedroom on this floor along with a bathroom. The first floor has 3 bedrooms, one of which is the master bedroom with double bed, and the other two are twin rooms. They all have ensuite facilities and again great views out to sea. Bedroom 4 is a double bedroom on the ground floor. The Lower level has the 5th bedroom ( twin) and shower room with loo, where you also find a large games room with table tennis table, a snooker table and table football which is great for kids and adults alike. You enter the property on the ground level, from the side of the property and can park your car either on the drive or directly outside the property. The pool, terrace and garden area are situated on the 'sea view' side of the house with all the fantastic views. The pool is kidney shaped around 8m by 4m in size. The garden area is planted out with palms and shrubs, and the terraces with pots. We also have a covered soft seating area as well as a covered dining area. On the Pool side we have showering facilities. All bedrooms have fitted wardrobes. Wifi/internet access is provided along with pool/beach towels for your convenience. All bedrooms and sitting room have air conditioning. We take a £250.00 security deposit which will be returned to you within approximately 5 days once the Villa has been inspected. Final Balance Payments are due 2 months prior to arrival. Cots and high chairs can be provided please ask. The pool is cleaned weekly by our professional managers. The pool area has lighting with the pool having internal lights on timers. It also has an outside shower, poolside. A barbecue is also provided.Central heating can be accessed and available in the cooler periods for a set charge, please ask for information. For stays of 2 weeks a mid stay clean is provided. We also provide pool towels. A car is essential if you wish to take in the historic sites around the island and visit the many sandy beaches although transfers can be arranged to and from the airport if you wish to stay local during your vacation. This Villa has 5 bedrooms, 5 bathrooms and sleeps 10. It’s been listed on Holiday Lettings since 18 Nov 2010. Located in Peyia, it has 21 reviews with an overall rating of 5. The average weekly rate varies from £1031 to £2004. A few days in this wonderful villa was the perfect anecdote for busy lives at home. The villa is of a very high standard with everything you could wish for. It is very well maintained with Jo, the owner, keen for feedback and wanting to ensure everything just right for the perfect holiday. The views from all parts of the villa are amazing- you cannot tire of taking them in at all times of the day and night. The pool is very clean and refreshing and was used throughout the day and evening. Several outside areas to sit, eat, relax and lounge with shaded areas for those who like some respite from the sun. Several lovely restaurants within easy driving distance which we took full advantage of. Advise having a car whilst staying here although it can be tempting not to leave the villa at all! For peace, quiet, calm and total relaxation this villa cannot be beaten. 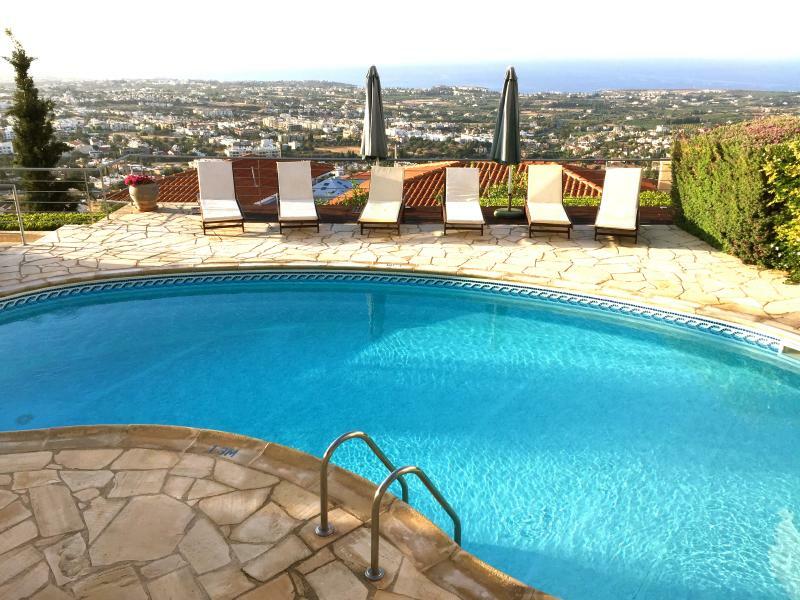 Chez Max is a superb villa located up the side of a rather large hill overlooking Peyia.. Being on the western end of the island it is well positioned for those wanting to explore the national park including turtle bay. This is our second time back with the same set of friends and our small cluster of children. We all wanted to return to Chez Max for a number of reasons; the accommodation is to a high standard and the pictures really do provide an honest reflection of what it's like. The view from the pool and house is captivating both day and night. There are three master bedrooms with on suite on the top floor all of which are kitted out well. And a further double room on the main floor with a bathroom next door. The entire house has air conditioning (vital!). Jo, who manages the villa, has always been helpful and welcomed feedback. The first time we went the wifi was down, when we advised her it was sorted straight away, thus enabling us to stream SoundCloud to our (own) blue tooth speaks outside.. both times we stayed a chap came to clean the pool and we were also visited by a lovely lady who cares for the villa and made sure we we were all ok. Whilst there are other villas around we were never aware of any noise.. In fact the most striking memory was at night, sitting outside, looking at the enormous view and twinkling lights stretching off in the vista below with a complete absence of sound. Have just spent a very enjoyable week at Chez Max with friends. Would thoroughly recommend this villa to anyone who wants a peaceful relaxing holiday. The villa is very well equipped, spacious and the setting is stunning, with panoramic views to the sea. Ample space around the pool, with comfortable sun loungers, together with outside shaded sitting and eating areas. The nearby village of Peyia offers excellent facilities for food shopping. We ate at the Peyia Tavern which was excellent, and also enjoyed other nearby restaurants. Would definitely recommend this villa if you want a relaxing holiday in Cyprus away from the busy tourist areas. We stayed in this villa for two weeks,( two family's with 4 teenagers) , and had a really great time ...the villa is very spacious, clean and modern. We have stayed in a few villas and this has been the best. The view at night is lovely ....sitting on the balcony seating ,area,overlooking paphos and coral bay area. Peyia is a good base for the sights of this side of Cyprus.the villa is peaceful and quiet ...but then it's not far by car to coral bay or paphos.we would love to return again as soon as possible! . We have stayed in a few villas in the local area, this property is one of the better. The views are fantastic. Suitated in a mainly residential area it's everything you require for a relaxing holiday. Very spacious and comfortable with all bedrooms having a bathroom and comfortable beds. There are several areas around the pool for sunbathing and a covered terrace to chill out of the heat of the day. Altogether just what you need for a wonderful holiday. Would advise car hire is necessary.